Readers of Martha Stewart Living and Martha Stewart Weddings magazines may not notice the changes once they become effective next month, but there has been a significant internal restructuring at the company that will outsource the handling of the magazines' ad sales, circulation and production, while the in-house editorial team will focus exclusively on content creation. The new partner handling sales, circulation and production of Martha's magazines is Meredith Corporation, which is a leading media marketing company dedicated to leveraging media platforms that serve American women. Meredith currently handles magazines such as Family Circle, Better Homes & Gardens, Traditional Home and Everyday with Rachel Ray. Under the terms of this transformative, multi-year agreement, the Martha Stewart Living editorial team will continue to create all content for print and digital properties. Meredith will also assume responsibility for the sales and marketing of the www.marthastewart.com and www.marthastewartweddings.com websites and MSLO's related digital assets, including its vast video library. MSLO will retain control over the brand's social media channels. The agreement, which applies to the United States and Canada, is effective November 1, 2014. 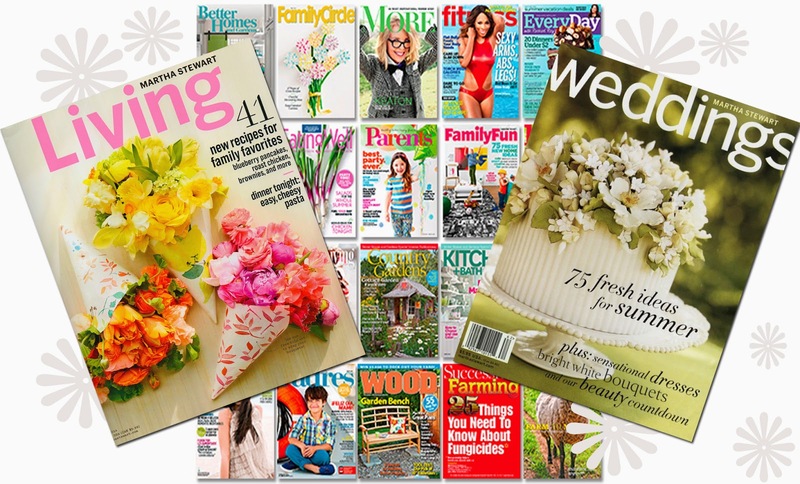 Meredith will begin delivering editions starting with the February 2015 issue of Martha Stewart Living and the Winter 2014 special issue of Martha Stewart's Real Weddings. "We are very excited to partner with a great company like Meredith, which has an excellent track record in advertising sales, operations and production of a library of some of our country's most popular magazines. Our editorial team can focus entirely on what we do best: the creation of inspirational, original, practical, useful, and trusted content for our superb publications and digital properties - content that continually enhances and improves consumers' lives," said Founder and Non-Executive Chairman, Martha Stewart. For readers who may be worried about a drastic changes to the magazine's look and feel, fear not! A spokesperson for Meredith noted that "the change will be invisible to the consumer, and strengthen the Martha Stewart brand in the advertising marketplace." I'm actually quite happy with this news. What I'm hoping it means is that we'll see thicker issues with more content, supported by an increase in ad sales. I'm also glad that the magazine's future now seems more assured than ever. The editorial experts can focus on what they do best while the business aspects are handled by a company with proven success across a multitude of media platforms. This will likely mean layoffs at MSLO, however, as it restructures its business, but I'm confident that this new, ten-year plan will only help the magazine grow and develop in the future. A source of mine at MSLO said 140 people have been let go across publishing, internet, IT and HR. Great news, very happy to hear this news. The content is so strong MSL should have thrived since its inception. Unfortunately between a serious recession, and changes in how we receive information it has not . I do hope this change will go a long way towards securing its future; all along knowing that many personnel who have worked towards the goal of producing a successful magazine will now, very sadly, have to re enter the job market. I feel the staff working at MSLO are all very talented and passionate people. But MSL is like college, at some point you will have to leave and apply what you have learned. So many good examples of that ... John Barcelli, Jodi Levine, Gayle, Stephen Orr, Margeret, and the list goes on. I do feel sorry for the folks getting laid off, but it's probably more like being pushed out of the nest. Let's hope they fly and we hear about their amazing new ventures.